If you're shopping for a new vice, we tell you what to look for so your money is well spent. 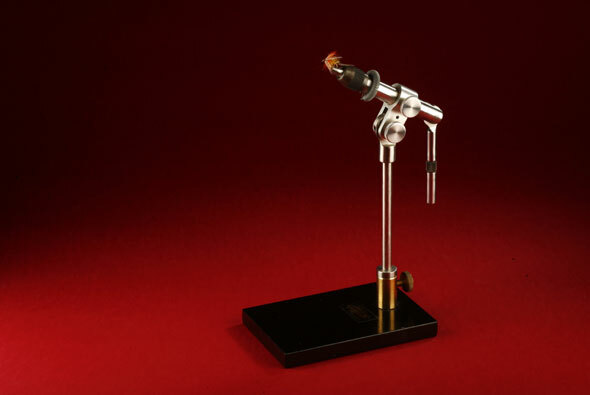 In most quality vices the vice body turns 360 degrees, a useful feature if you want to turn the fly and check the underneath or other side of the fly. But this does not make it a true rotary vice. For this you need an offset or cranked jaw that will rotate the hook shank around its own axis. The jaws should be made of the best tool hardened steel as this won’t wear or groove as badly as cheaper mild steel. Serrated pads on the inside edges give added grip. Jaws with two purpose-made grooves on the inside edge to accommodate the hook allow you to clamp down on both large and medium sized hooks with ease. Tips are only used for small hook sizes. In the case of the Kingfisher featured, the standard jaws hold sizes 8/0 in the rear groove right through to size 22 on the tips. Or, get a set of un-grooved midge jaws that will take sizes 8 to 32. Some vices are fitted with a material spring/clip as standard; on others it is an extra accessory. A useful little gadget as you can tuck materials out of the way while tying the fly. For example, a wire tied in ready for the rib could get in the way while you are trying to dub on a body, so just slot the wire into the spring to hold it out of the way until needed. Some vices come with a fixed head; others have a notch system able to lock the head into different positions. These are ideal when tying larger flies where a lot of pressure is exerted on the hook therefore risking vice head movement. A vice with a friction plate system can alter the head position like a see-saw and would be ideal for most applications. A pedestal base is useful because you don’t have to rely on having the right size table edge to accommodate a clamp, and it can be used on any flat surface. A C-clamp version is lighter and more suitable if you intend carrying the vice around. If you opt for a pedestal make sure the base is heavy (at least 2lb) and has some rubber feet on the bottom to prevent slippage. Some manufacturers make C-clamp vices with a much longer shaft than their pedestal counterparts. 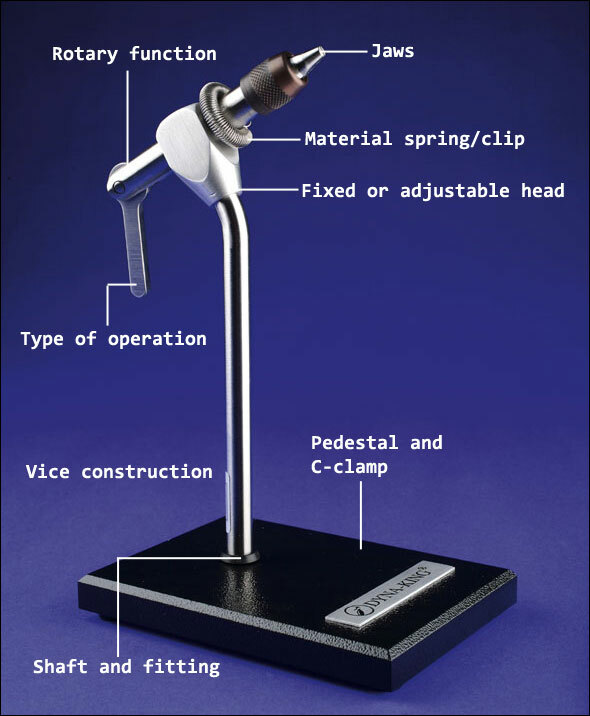 This is one thing to keep in mind if you have an existing pedestal vice and want to use it in a C-clamp fitting. You might find that the shaft is too short and your working height becomes difficult. The vice stem can be connected to the pedestal base with either screws or directly into the base (as in the vice pictured). Or on more expensive versions you will often find a collar extension fitted to the base. The stem slides into this collar and secures with a locking screw. This varies widely from cheaper cast or mild steel and composite plastics through to quality stainless steel and machine cut alloy. Stainless steel is the optimum material for all of the vice construction apart from the jaws. There are four main types of vice operation – screw collet, cam lever, spring lever and draw or push collet. Many cheaper vices use the screw collet system where a knurled wheel or screw pulls the jaws into a tube that closes them around the hook. Although this system gives an adequate grip it is not the best. A cam lever operation gives a far superior hook hold. A pin holds two bars together and a small lever is placed between them at the back of the bars. When this is turned it spreads the bars at the back, forcing the tips together, which in turn grip the hook. A small knurled bolt at the front allows for finer adjustments. The spring lever is similar, squeezing a lever forces the jaws open and releasing it grips the hook. There is no fine adjustment tool but it holds a range of hook sizes. With the draw or push collet system (as pictured) the jaws are set within a tube and by operating the cam lever at the back they are either drawn back into the tube or forced forwards to make them close securely around the hook. In many vices the cam lever has a notch in it so it locks tight into the final clamping position.